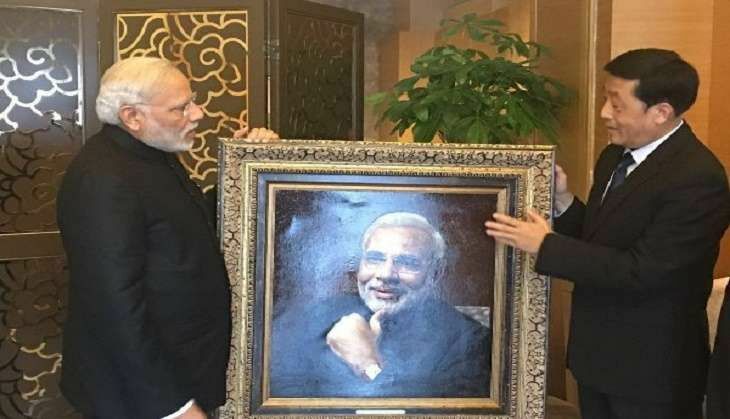 Prime Minister Narendra Modi met painter Shen Shu and his team from Hangzhou's Zhejiang Kaiming Art Gallery who gifted Modi with his portrait. PM Modi took to Twitter to express gratitude to the painter and his team, saying he was 'touched and honoured with their gesture'. "Thank you to painter Shen Shu and his team from Hangzhou's Zhejiang Kaiming Art Gallery for the special gesture today. Was told during our meeting that Shen Shu and his team worked for four months to complete the portrait. Touched and honoured by the gesture," he said in a series of tweets. Was told during our meeting that Shen Shu & his team worked for 4 months to complete the portrait. Touched & honoured by the gesture. Earlier, the Prime Minister also met Indophile Professor Wang, who translated 10 ancient Indian works, including the Gita and Yoga Sutras, into Chinese. "Glad to meet Indophile Prof Wang. He translated 10 ancient Indian works including the Gita, Yoga Sutras into Chinese," Prime Minister Modi said.